There was the sad news today of a mother of 5 being killed by a crossbow. At first I thought it was a local British Pakistani affair. However it seems this was a bit of a twist as seen below. 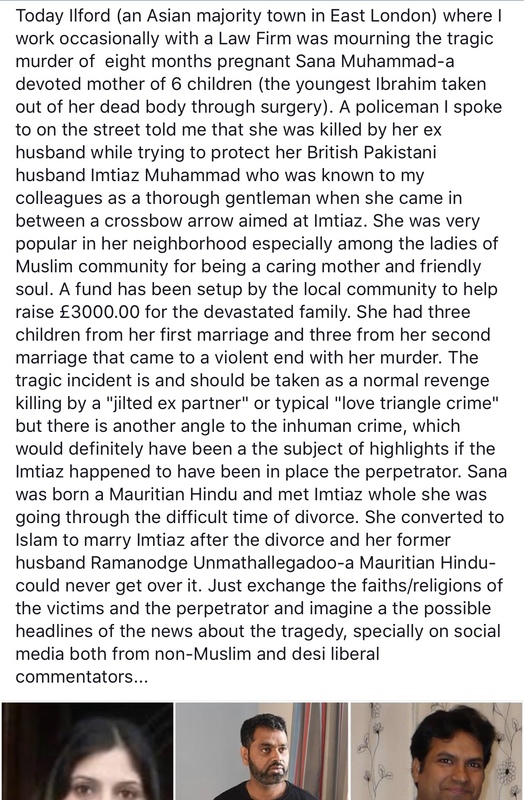 The lady who passed away was a Hindu lady who converted to Islam to marry her second husband (she had three kids with each husband and her last child was delivered off her dead body). It’s obviously true that if it had been the other way around the “Muslim” angle would have been hyped up. I do agree there is a religious angle, but looks like she was already divorced when she married and converted. It looks more like revenge(if the ex-husband has done it) than religious(not denying similar cases related to religion have not happened). Mostly the killing is done by close relatives/family and not the ex-husband / boyfriend. For the latter i have seen its mostly pure revenge. Perhaps the reverse situation would have invited commentary from a religious angle because Islam sanctions death for apostates? The post seems to me to be another of those cases of false equivalences. Just to clarify, I do not think it’s wise to make claims about such crimes being religiously motivated unless you have evidence irrespective of the parties involved. PS – I do not know many Mauritian Hindus. Are they usually religious? Does the British economy permit raising such families? How do the immigrants do this? In both, South India, and US, the average child per couple has been on a free fall, to < 2 over the last 10 years. Zero dollar births used to be a thing until 80s, but now we increasingly end up with a several thousand dollar bill here; the situation is equally bad in India. This is a tragic incident. I’m getting a bit tired of all the Hindu-Muslim stuff on BP. Surely, we can find other topics. Sometimes its just banter, dont take all these things too seriously. Its not as if what we discuss is really having some effect on the politics of it. It’s boring and also toxic. Intelligent and educated people living in the West need to get over all this Hindu vs. Muslim stuff. Kabir, it isn’t Hindu vs. Muslim. If you want to comment on this please try to understand. With understanding, adjustment is automatic. If you don’t understand, then don’t be surprised that 40% of Gujarati muslims voted for Modi’s BJP in the last national election. You might ask yourself why this is happening. Yes it is partly a response to Indian muslims feeling threatened by Islamism. But I suspect it is more about Indian muslims being outraged by the post modernist mindset. You are neither an Islamist nor deeply understand Islamism, faith and the psychedelic mystical experience through the brain and nervous system that is associated with faith. But at least you are not responsible for Islamism. —Because of this, with the best of intentions you sometimes unconsciously assume that others (especially darkies and minorities) are not potentially indescribably powerful, wise and sovereign; and that others cannot manifest their own miracles. —You also don’t deeply understand why others yearn to be free in their art and thoughts. —You also assume that when we hurt others we benefit. Versus the truth that when we hurt others (or oppress or exploit or be hegemonic/imperialist/colonialist towards), usually we usually harm ourselves far worse than we harm the person we are trying to hurt. Others, especially oppressed darkies and minorities, find a lot of what you write to be offensive, even though your intention is to love and help. What the hell are you on about? I can read all the words but they make zero sense. This blog post explictly frames the issue as a Hindu-Muslim one. “If you want to comment…”. You are no one to try to censor me. Cease and desist. The issue isn’t Hindu versus muslim. It is Hindu and muslim versus post modernist. Then we can go our WOKE meet up bash where we all discuss our straight “A”s minus our shared B+ in Physical Education and Sports! Ever tried one of Joe Rogan’s [hero of the intellectual dark web] favorite Osadhi “DMT”? Ya gotta live a little! Jaggu is here bro AnAn. Kabir (henceforth anagram: barki) is a crypto-islamist. In simple words barki is a bak bak desert cultoo apologizer. Don’t waste energy on barki. He will not listen to Dhamma. I used to like barki when I was of the desert cult myself. Though I hv realized that true Turks must go back to their real Arya rootz …Arya of the Dhamma. spiritual warriors and khidmatgars. Hez been told off by bro Razib countless times but he just won’t geddit. Omar bro, Slappy bro nobody talks to him coz barki barks up the wrong tree every time. I don’t want to engage with barki anymore too and neither shld u. The feeling is mutual, Jaggu. I have no time for weirdos. The Hindu ex-husband was trying to kill the Muslim husband and the converted Muslim wife got in the middle. This has nothing to do with “postmodernism”. Please never ever try to “dialogue” with me again. I find your worldview to be incredibly bizzare and frankly I have no more time for you. It isn’t the incident that relates to “postmodernism”; rather it is the response to the incident from distant observers, including our mutual BFF. I’ll let you have the last word. Keep blaming “postmodernism”. I’m completely done with you. Please never speak about me or to me. You don’t need to worry about my “whole of system understanding” (whatever the hell that means). I am doing just fine as a member of the reality-based community. “Slappy bro” :LOL: Me is TOTAL Slapstik fan. “bro” . . . our mutual best friend forever (BFF) finds “bro” offensive. BTW our BFF is not a “crypto-islamist.” He doesn’t deeply understand Ibn Taymiyyah, Islamist Jihadi theology or epistemology. He doesn’t understand the blissful peaceful consciousness subjective experience through the brain and nervous system that causes Islamists to have faith and do what they do. And gives them the capacity to do what they do. He has touched sound brain therapy through music, but doesn’t integrate this with his whole of system understanding of all things. We should be fair with our mutual BFF. And send him love and respect with all our heart (Bhakti), all our soul (Jnaana), all our mind (Raja Yoga), and all our strength (Karma). Of the four primary paths . . . Sadguru Avatar Buddha, peace be upon him, emphasized Jnaana a lot it seems to me. Albeit Mahayana has a large Raja Yoga stream, including of the Tantra variety. Of course, all paths are really paths of love (Bhakti). Arya Putra Jagguji, have you decided between Theravada and Mahayana? Personally I am a humongous fan of both. obv mahayana. Thatz what my Turk forefathers followed until they lost their way in the desert. but future is Sangha! Mahayana rocks. Dude we be fused Shaivite [subset of Uttara Mimaamsa, subset of Purna Mimaamsa, subset of Sanathana Dharma, subset of Arya, subset of everything] Mahayana goodness. The six big Shaivite lineages each have Nath Siddha yogis. Some are common for all six. Others are only part of one, two, three, four or five of the Shaivite lineages. Many of the 80 Maha-Siddhas of Mahayana Buddhism are dual hatted. They are revered by both Mahayana Buddhism and the Shaivite orders. Mahayana Buddhist orders, including the Dalai Lama (Vajrapani Mahayana Buddhist Order) are members of the principle Sanathana Dharma interdisciplinary organizations of long and deep standing. For example they are part of the Akhara that organizes the Kumbha Mela (among other things). Japanese Zen (subset of Bodhidharma’s Chan, subset of Mahayana, subset of Buddhism, subset of Sanathana Dharma, subset of Arya, subset of everything) were part of the organization, construction and maintenance of the Hindu Angkor Wat temple in Cambodia. After 700 years or so the Buddhist aspect of the temple became more pronounced. Obviously Buddhism was part of the temple from the start. Arya Putras . . . Turin perfection and admirer of Turin perfection.